Large selection of options – In the countertop line you can choose from over 60 different colors, sizes, bowls, faucet hole layouts and edge designs and thicknesses. Shower doors are available in different glass thicknesses, door handle and glass options for a custom experience. 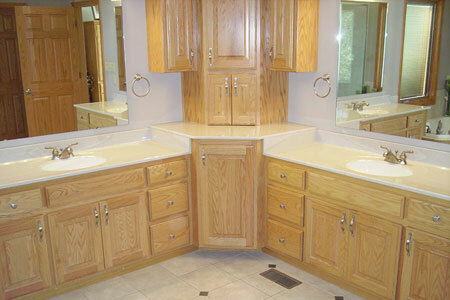 These countertops can be matched with the solid surface shower base and walls as well. Improved functionality – Just like a dress – a shower and tub system is not complete (and does not maximize it’s functionality) without the right accessories. Add safety and a higher level of relaxation with corner and bench seats. Have more places for soaps and shampoo with new shower caddies, shelves and niches. Add style and increase longevity – Choose decorative solid surface trim and window kits to both personalize your bathroom and eliminate the worries of wood deteriorating. Standard or custom showers you’re covered – Whether your space is a common size – or not – there will be shower door, trim and accessory options to ensure a more luxurious and better working space. Systems are designed to work together – Shower doors can be sized to fit with your solid surface wall panels and base – taking the worries out of sizing the project for you! Just like a great outfit is not complete without the right accessories – the same holds true for a top-rate shower or solid surface tub surround project. Fortunately our line provides a wide range of decorative and functional options. Take the worries out of finding and sizing a shower door to fit your standard or custom solid surface walls and base. With our shower door program we offer a wide range of shower door options for all the different base layouts (available in different glass thicknesses, handles, finishes and glass options) to create a luxury look at an affordable price.